This spread chronicles a trip we made to the San Diego Museum of Contemporary Art with a University Living Learning Community. While I think that this museum is a great one for kids – they have a seesaw that is a cannon that squirts water! – my son really wanted to touch everything – and of course at an art museum that is probably not a good idea. 🙂 However they had lots of outside art that you could put your hands on – so we spent much of our time outside. My favorite picture in this set is in the bottom right hand corner. My son had been hyperactive and was in trouble and he was pouting by sitting on the inside of this piece of outdoor art sculpture. 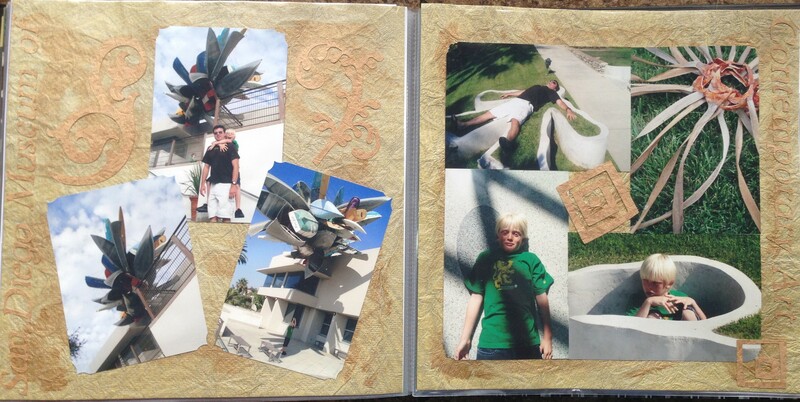 the top right hand picture was actually not a piece of art at the museum – we were sitting under a palm tree and these had fallen to the ground – so I put them in this grouping to take a picture. Later I saw other museum patrons taking pictures of this as well – so I hope that they didn’t think that it was one of the displays! If you look very carefully at the right and left borders of this spread you will see that it reads “San Diego Museum of Contemporary Art” in a slightly darker gold than the background paper. These letters, and all of hte other decorative pieces that you see on the pages, were cut very carefully with my Cricut Machine. Since this is very fibrous paper this was a very difficult process and I had to redo several of the letters before they were cut without tears (the ripping kind and the eye kind). Notice on the right hand page that I put the pictures into a cube shape and only corner cut the outside edge of the cube, which emphasized the collage nature of this page. thanks for stopping by my blog and liking my “La Jolla in May” post. Love the concept for your blog. Although a women, I appreciate the art and time it takes to scrapbook. Used to do a bit of it myself.